The Mustangs will meet this Thursday at 8:00 AM at the Posse Grounds meetup. Thunder Mountain Highlights is considered a difficult hike of approx. 7.5 miles and 1650 feet CEG. There are some ledges, rock scrambling and steep sections. Note: The hike is in Thunder Mtn area featuring the highlights in the foothills but does not include the climb to the top of Capital Butte (Thunder Mountain). 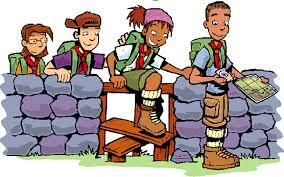 The Amblers will meet this Thursday at 8:00 AM at the Posse Grounds meetup. Cockscomb Base is considered a difficult hike of approx. 4.0 miles and 480 feet CEG. There are some steep sections. Note: This hike will first go up to an overlook point on the flank of Cockscomb (via a steep path that does NOT require hand over hand climbing). Once all of the Amblers are at this overlook, the more adventurous Amblers will proceed to the top of Cockscomb (via a path that does require some hand over hand climbing) for lunch. The views from the top of Cockscomb are tremendous. Sun exposure. From blisters to snake bites, learn how to be prepared to prevent and treat medical problems that can happen when you are hiking. The information shared by Dr. Curt Kommer can help you make quick decisions when faced with injuries of yourself, a fellow hiker, or someone you run into on the trails. Please read and download a copy to reference at the beginning of each Hiking Season. 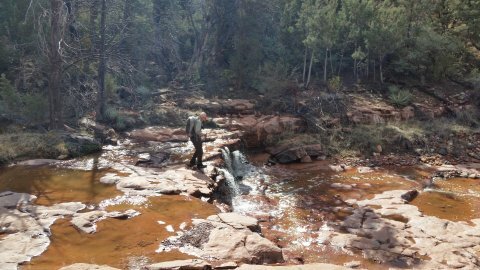 Wildfire Update — Please be aware of the updates for Kaibab National Forest Updates for Wildfires. 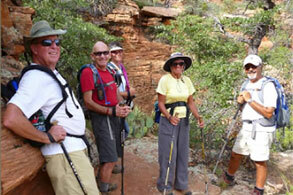 Gus Rousonelos, hiking with the Sedona Westerners, is crossing Dry Creek while hiking on the Munds Wagon Trail. 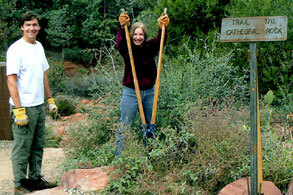 Seasonal rains can often make crossing what are normally dry creek beds a real challenge on many of our local trails. 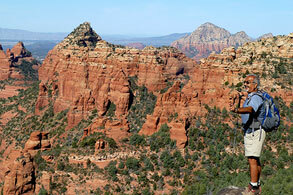 This historic trail was once a popular cattle trail to get out of the Sedona area. Upgrading of the trail began in 1896, but was not completed until 1902. It was first known as Munds Road and then later, as Schnebly Hill Road. © Sedona Westerners. All Rights Reserved. Header images © Mark Frank Photography.